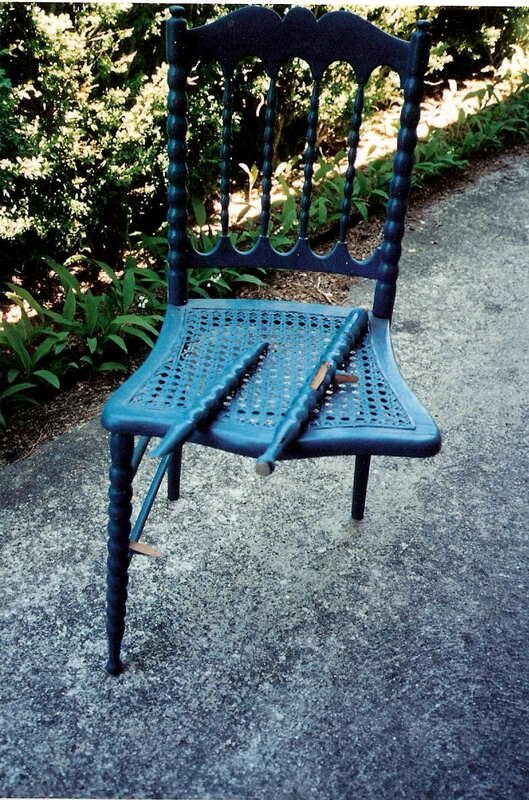 We repair almost ANY chair. 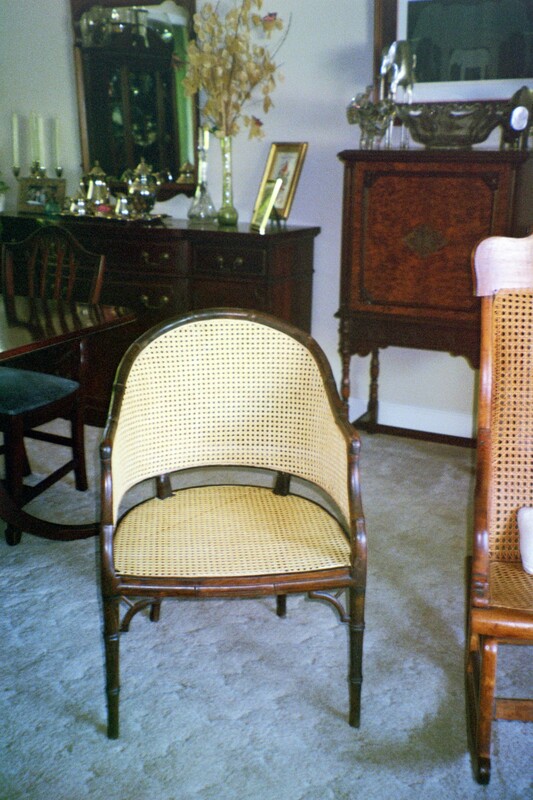 We can do all types and patterns of rattan caning. 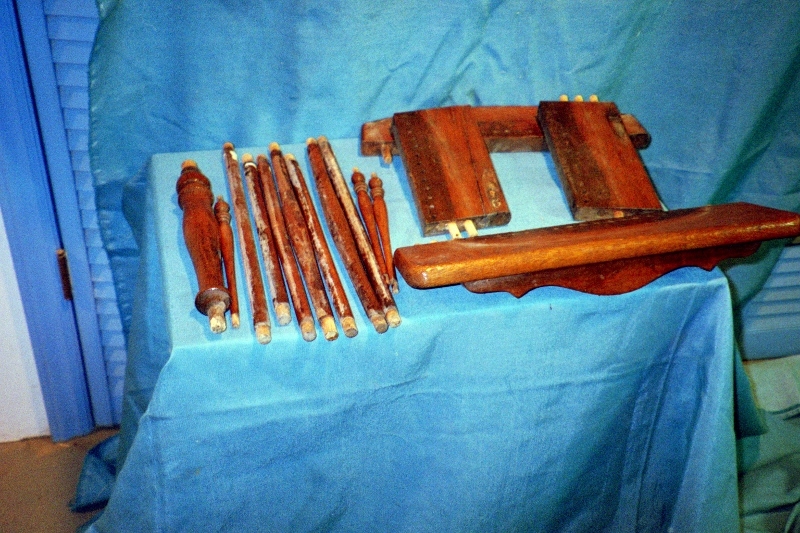 Several procedures of mechanical rush or sea grass. 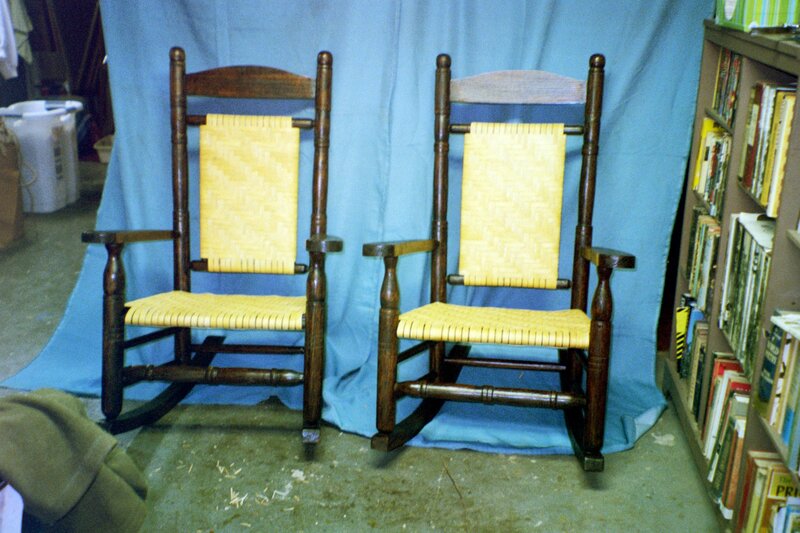 68 different patterns of rattan reed in all sizes including porch rockers and couches. 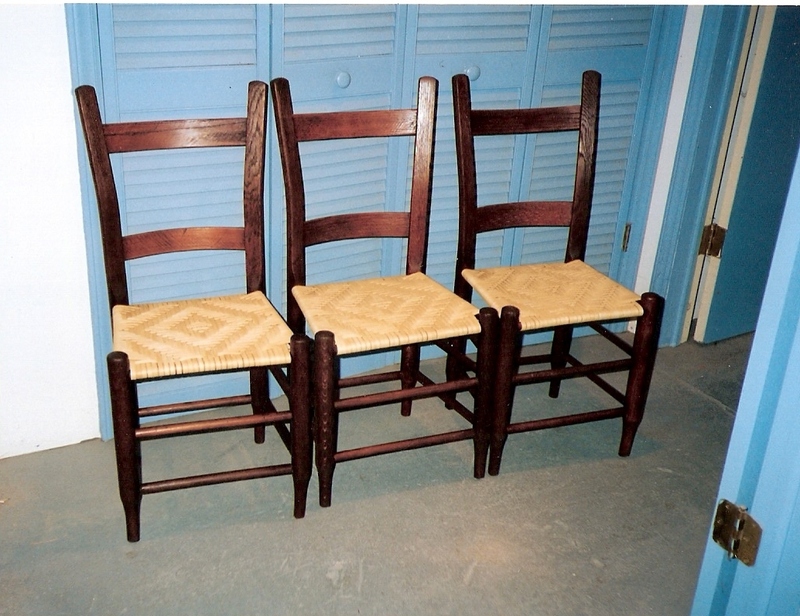 Repairing, refinishing, and top-finishing are available. Here are some examples of my work. Click on any image to see a close-up. 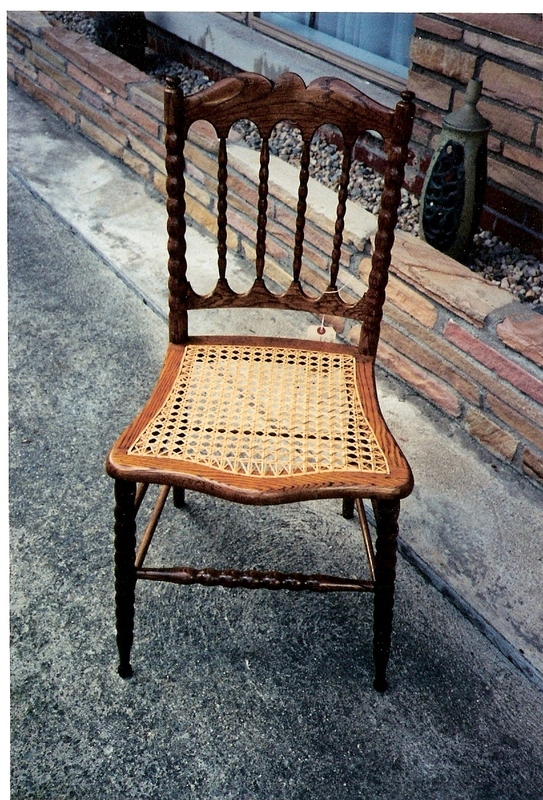 This is an example of hand-woven rattan caning. This is a classic procedure that requires patience and attention to detail. 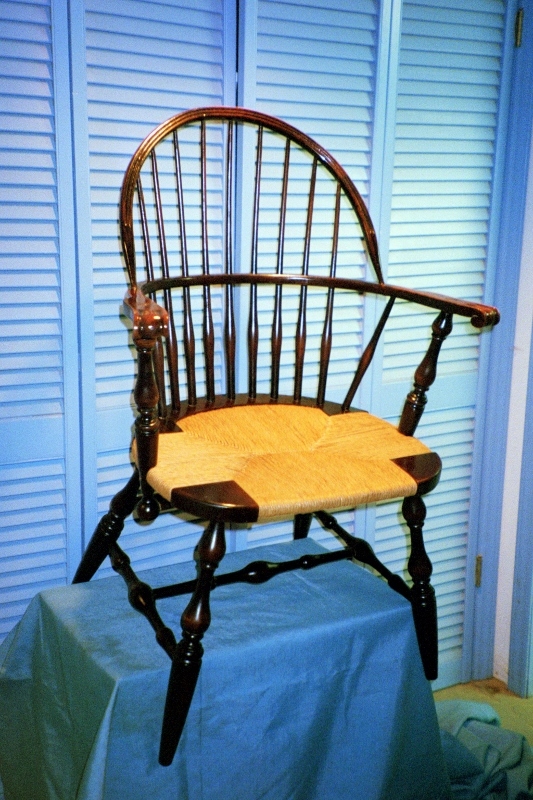 On this antique "Federalist" chair, the first step is taking the chair apart and marking each part to make sure it will be reglued in the original manner. 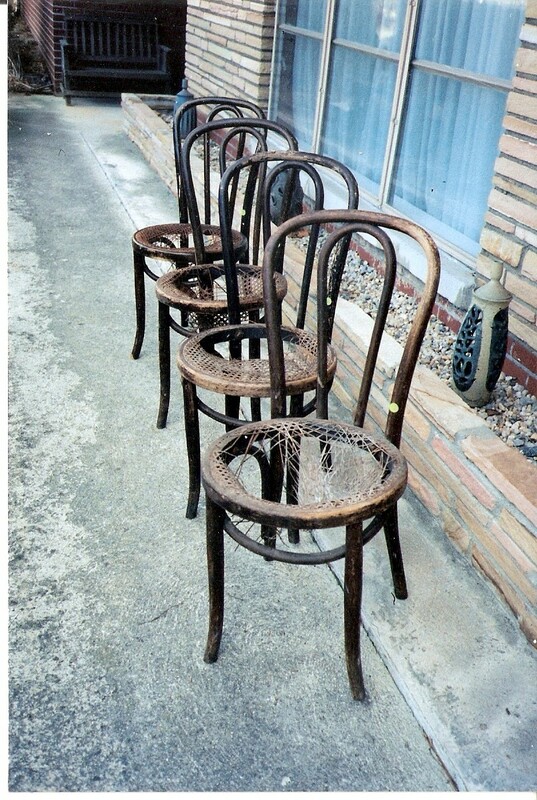 Stripping and light sanding are almost required on chairs this far gone. 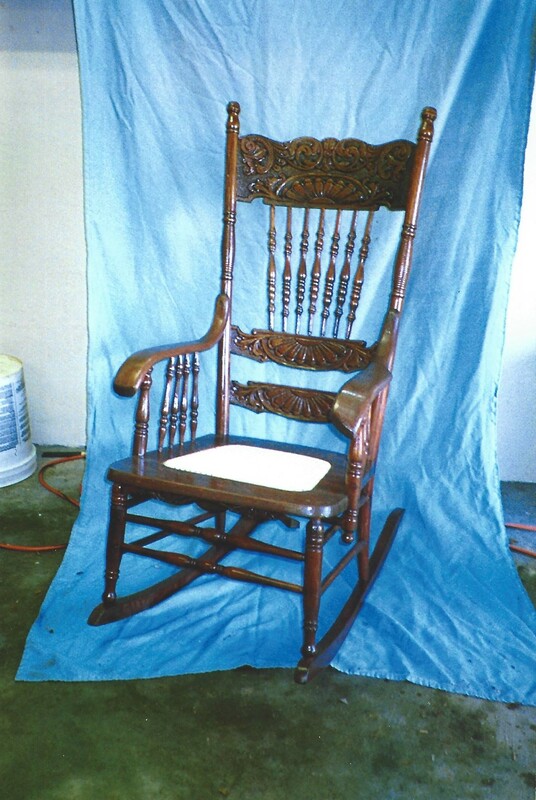 After gluing, one or two coats of stain are required, followed by two coats of the Chair Doc's handrubbed Oil Finish. This is an example of mechanical rush. No matter what the original weave design is, it can be reproduced. 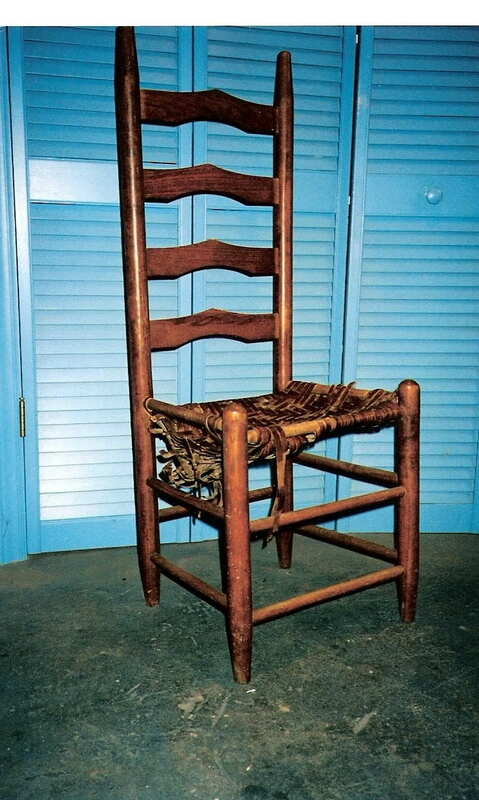 Or you may choose sea grass, which give the chair a completely different look, one with more texture. 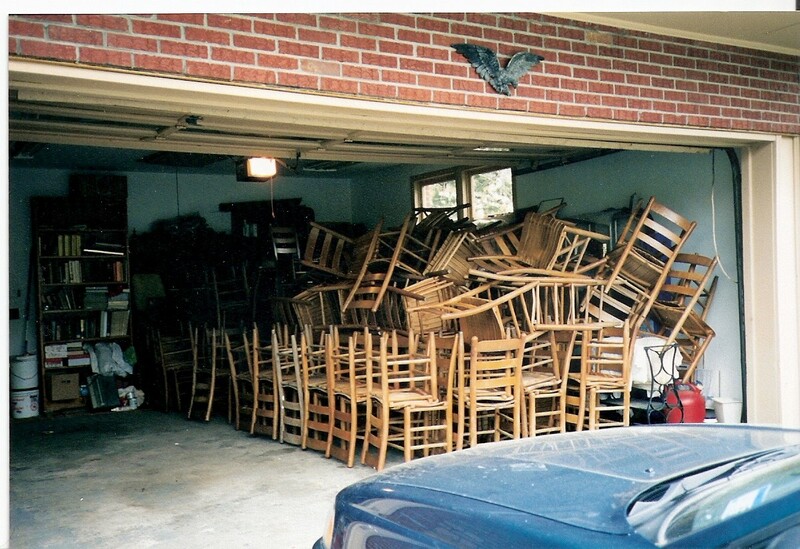 Do you think you have a chair that isn't worth saving? Pieces like this are hard to find. 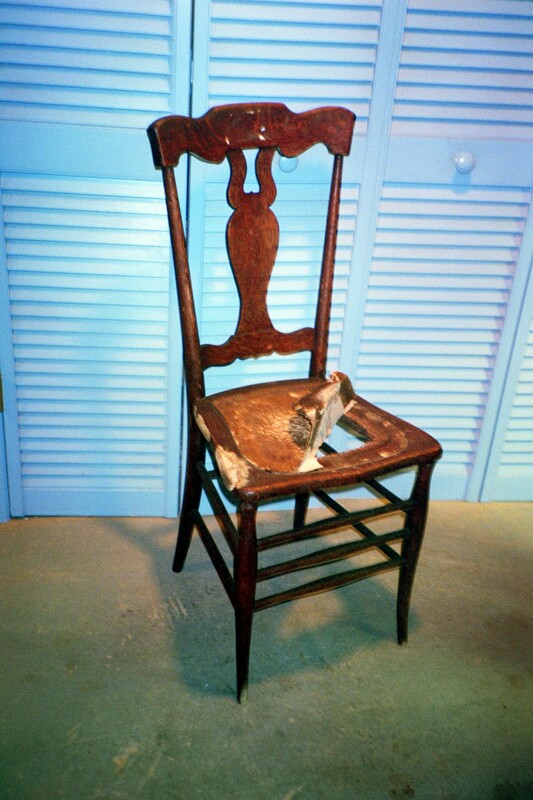 Underneath that ghastly blue paint a solid walnut late 19th century boudoir chair emerged. 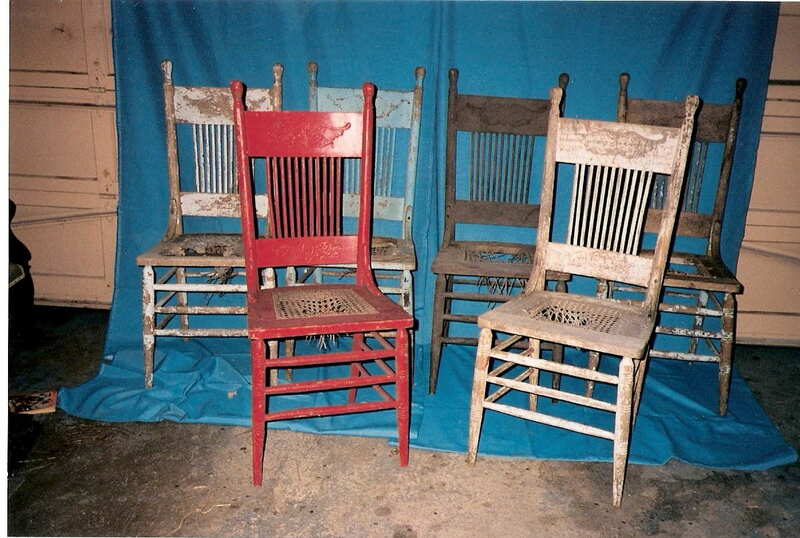 This antique ladderback (and its five brothers) is the perfect example of an old chair that shines after a complete restoration. 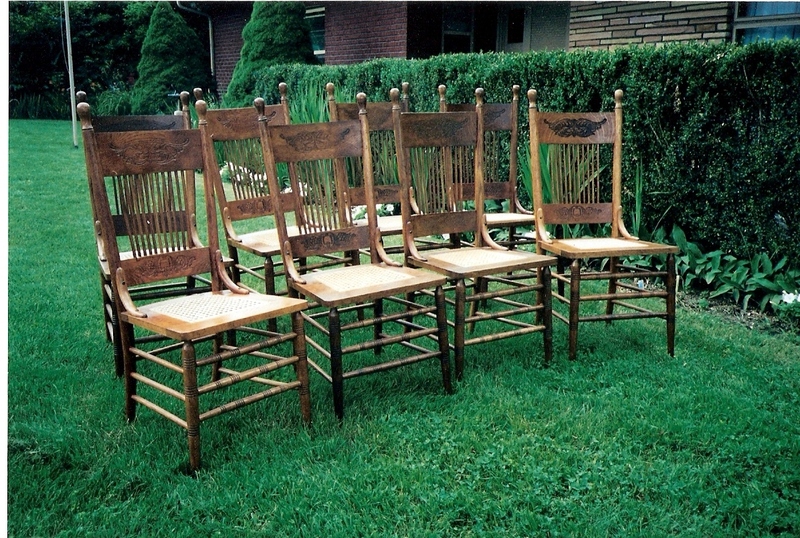 The owner chose a rush seat for all six. 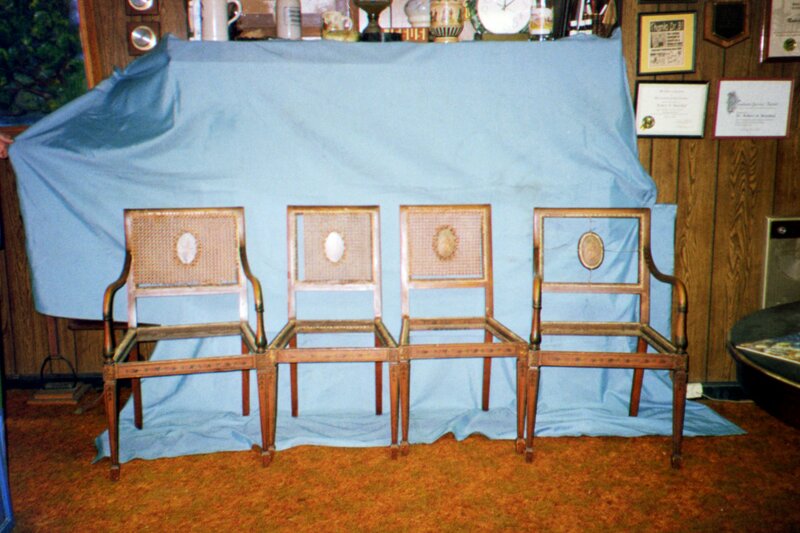 Here we have 6 chairs with double pressbacks that weren't treated as the classy set that they are. With some TLC and someone who understands how great these old pieces are, they end up looking like a millions bucks. New back, new seat, repaired arm. Completely restored. The one on the left is what I feel like in the morning sometimes. 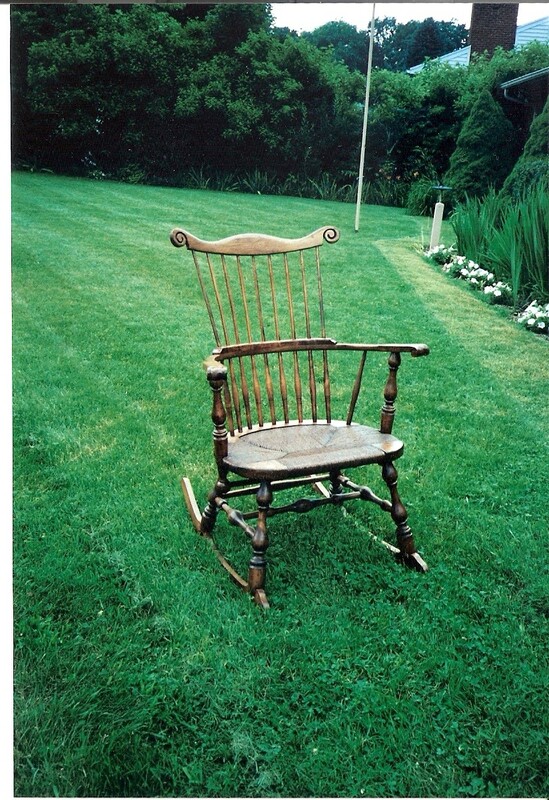 This is a Kennedy rocking chair looks like it was used as a tackling dummy for the family football games. 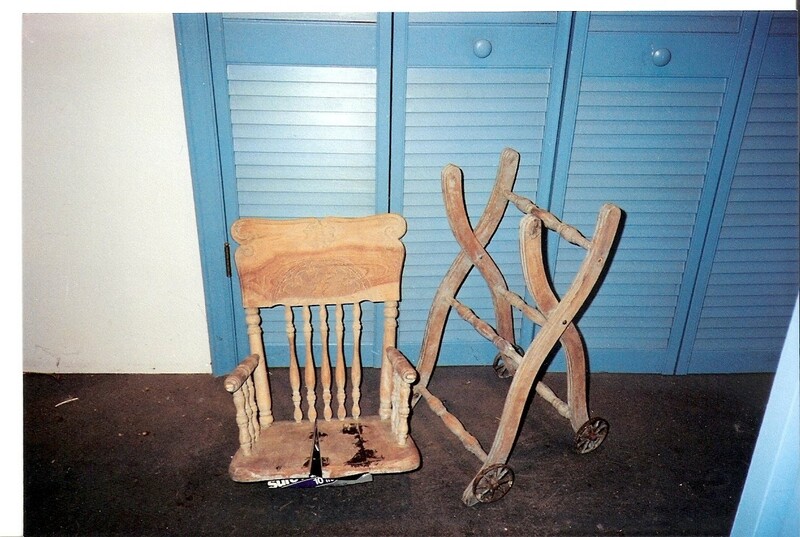 The seat and the back in the original are machine made. When I replaced them, I used the "Exploding Diamond" pattern. 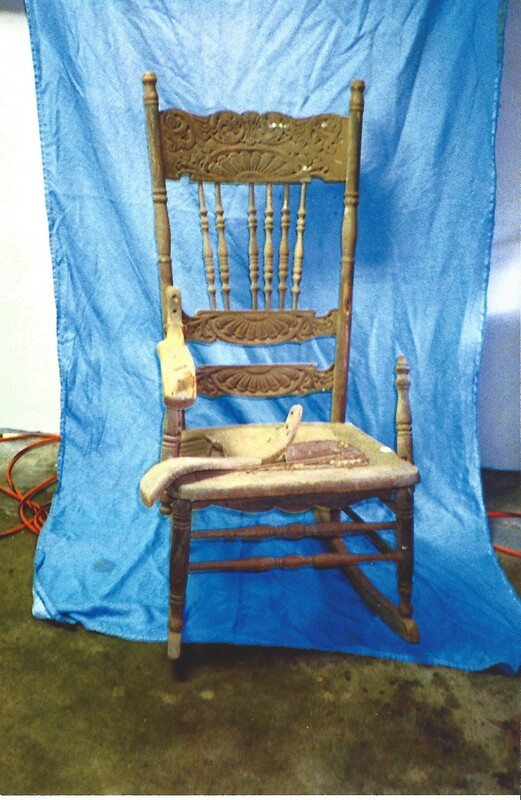 All of the rest of the parts of this iconic chair were restored to their original beauty. 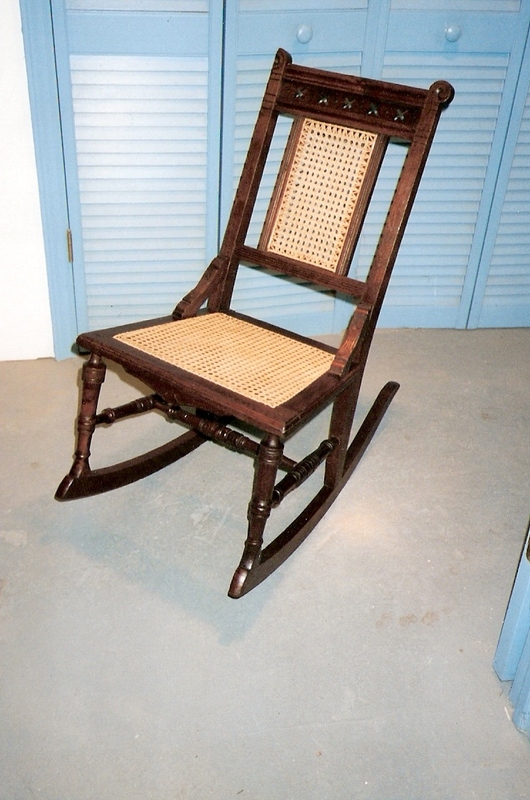 This chair was originally made by the P&P furniture company in Troutman, NC, and recommended to a young senator from Massachusetts who was experiencing back pain in the 1950s. The rest is history. This was a thrift store rescue that looked like it was recovered in Liberace's pajamas. 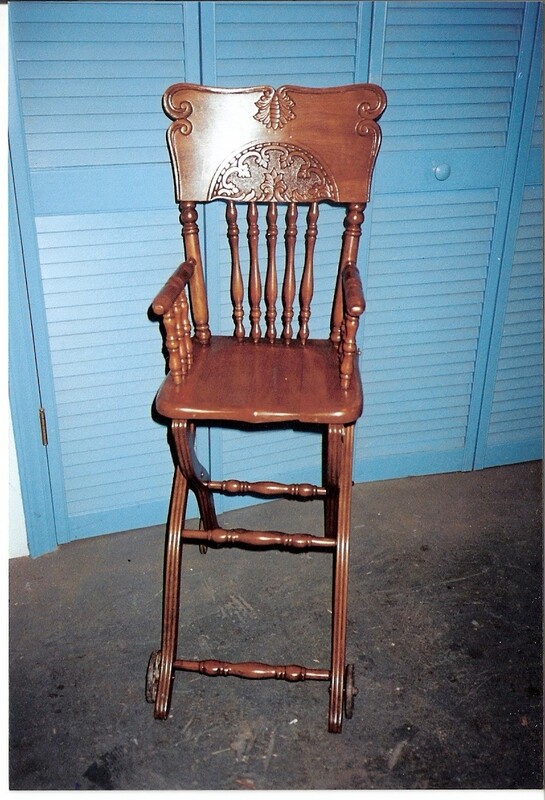 My granddaughter put her cell phone down and we were able to spend a memorable time working on all aspects of chair restoring. Then, with her cell phone she took this picture. 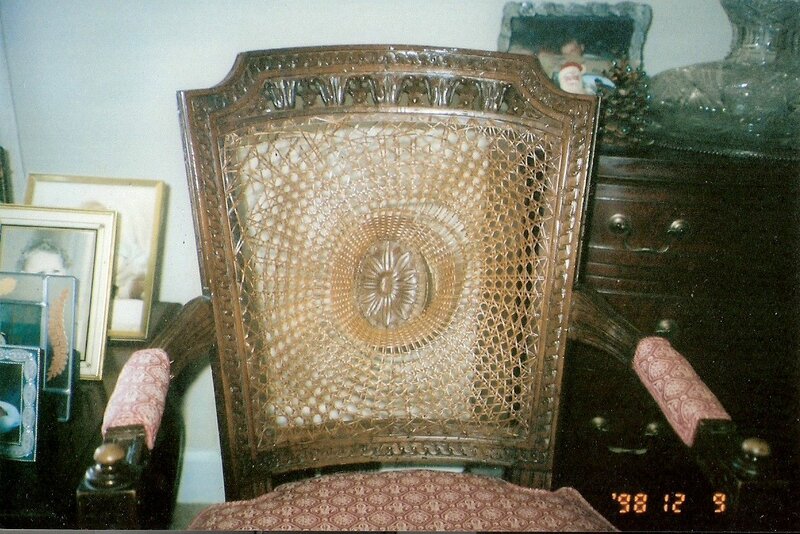 Not only does she have the picture, she also has this chair in her bedroom. 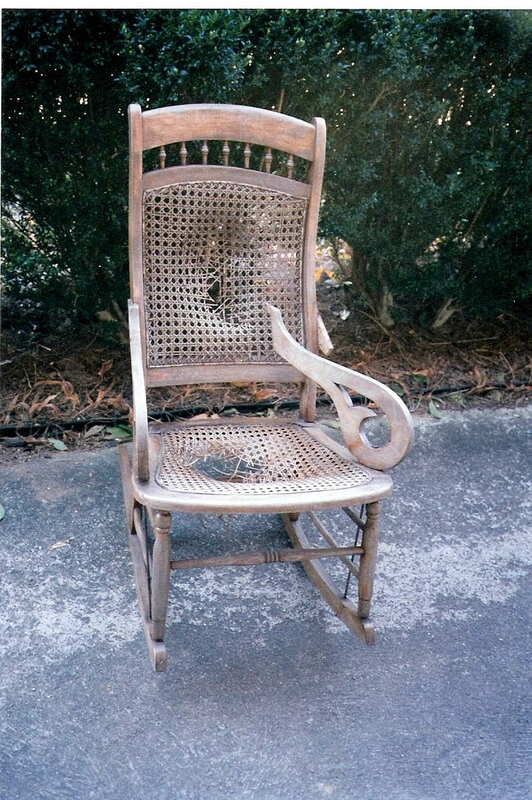 And I also have a great memory of this chair, too. 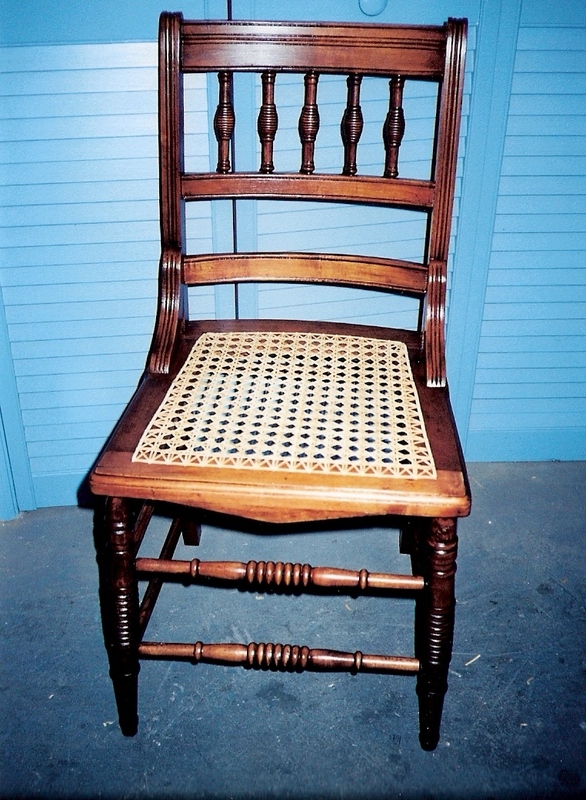 This antique 7 spindle Federalist Windsor was very close to being used as firewood. 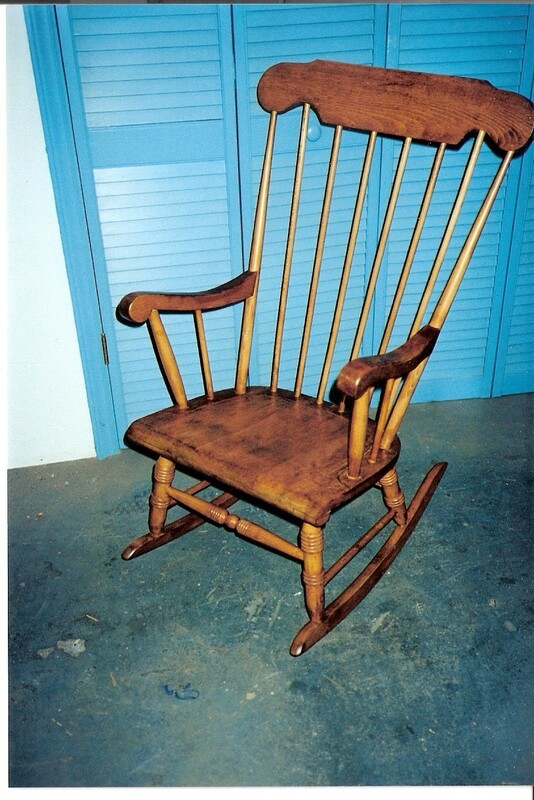 Notice the back support spindles and the thickness of the seat. 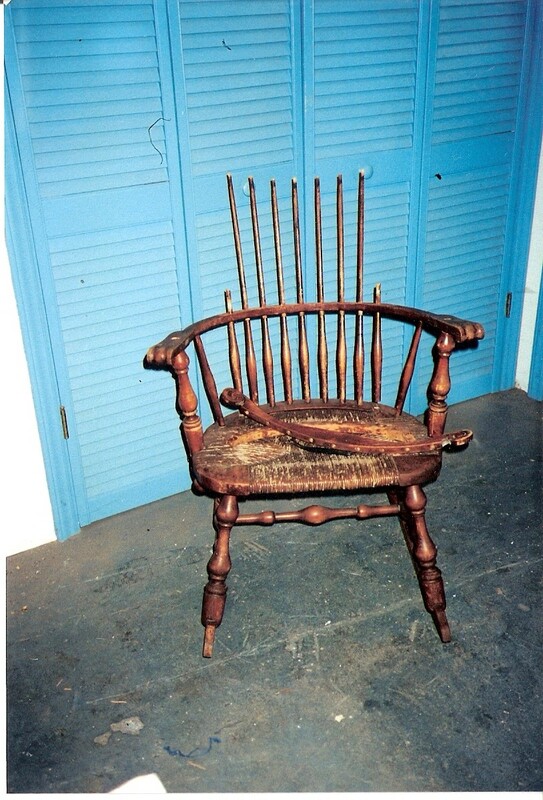 What a great old rocker! 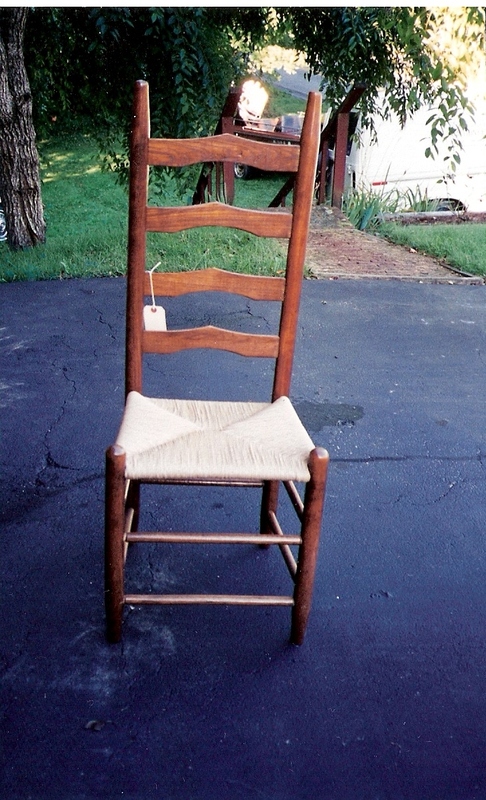 Besides caning and reed work, we'll also fix up chairs that were used to fend off a bear attack. 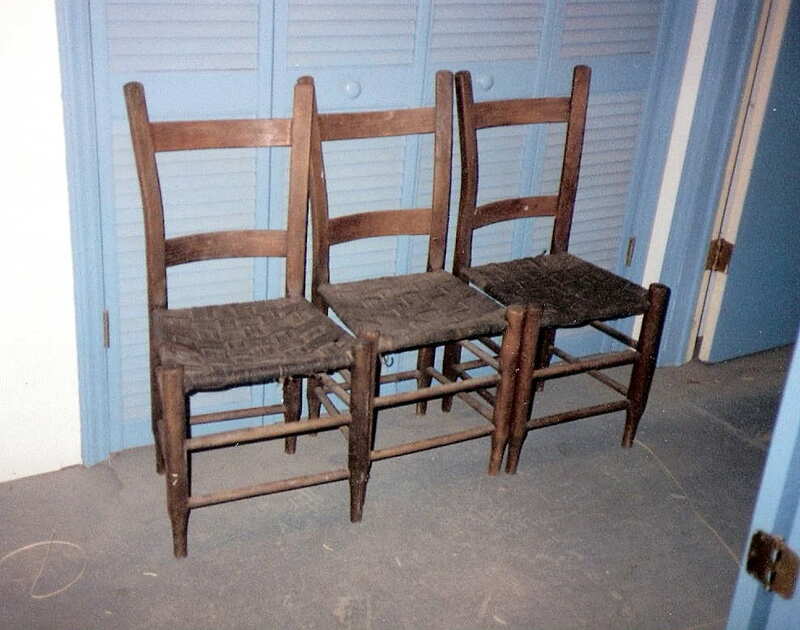 Old chairs such as these three are rather easily found. Most of the time they are well made and in good structural shape. 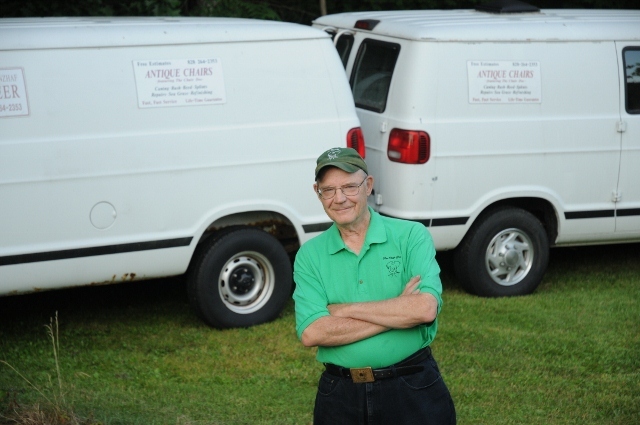 Complete restoration is easily accomplished. 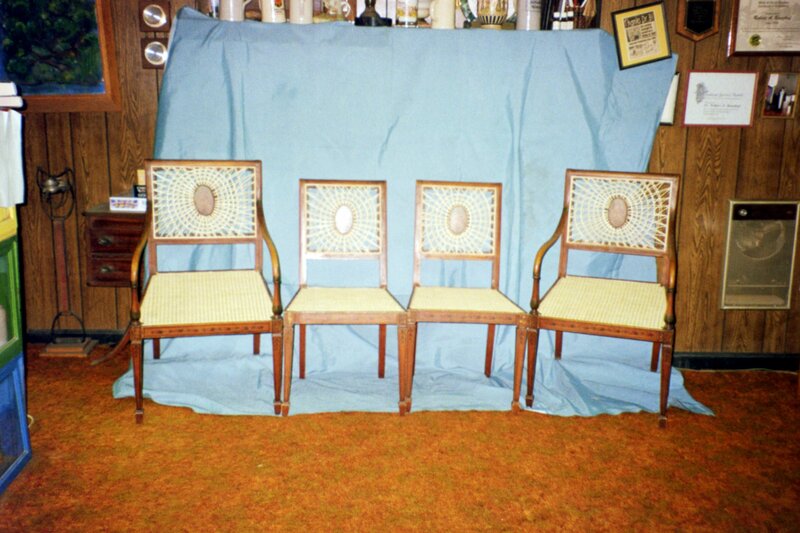 The diamond pattern in these seats is a classic design that makes this set a real conversation piece. 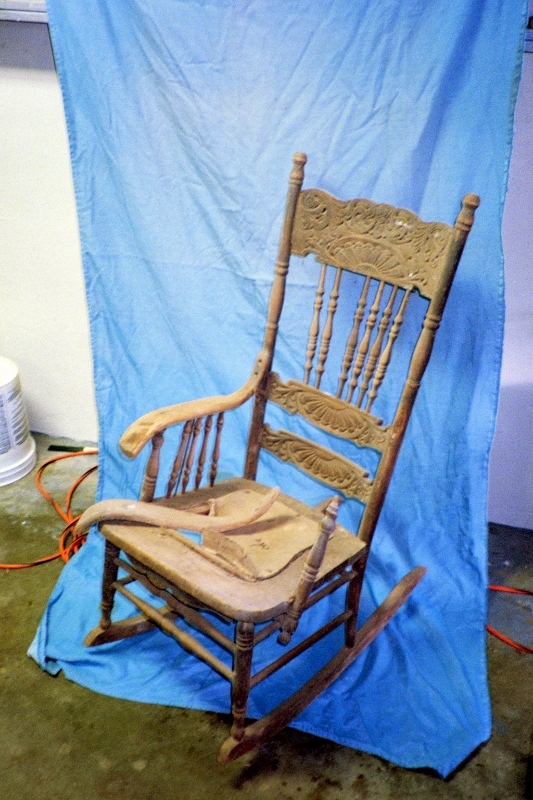 Sometimes folks get started on repairing Grandpa's chair. 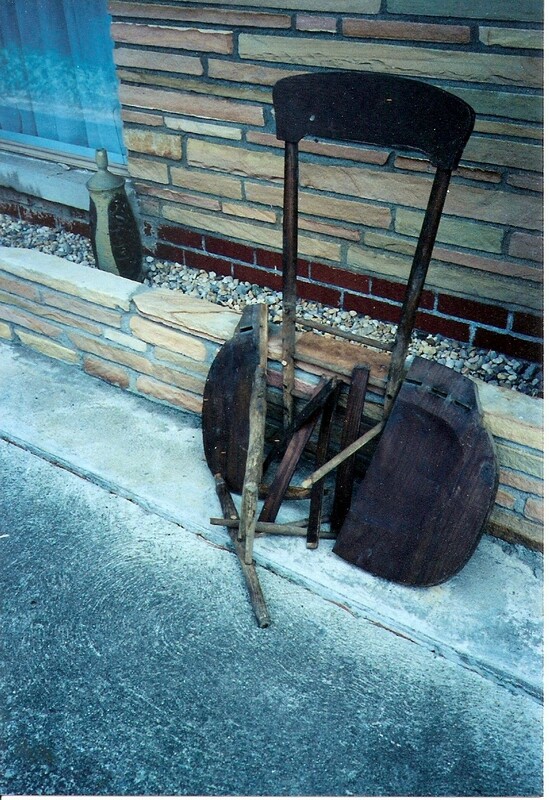 In time, enthusiasm wanes and the "bucket of chair" comes to me. Why bother? 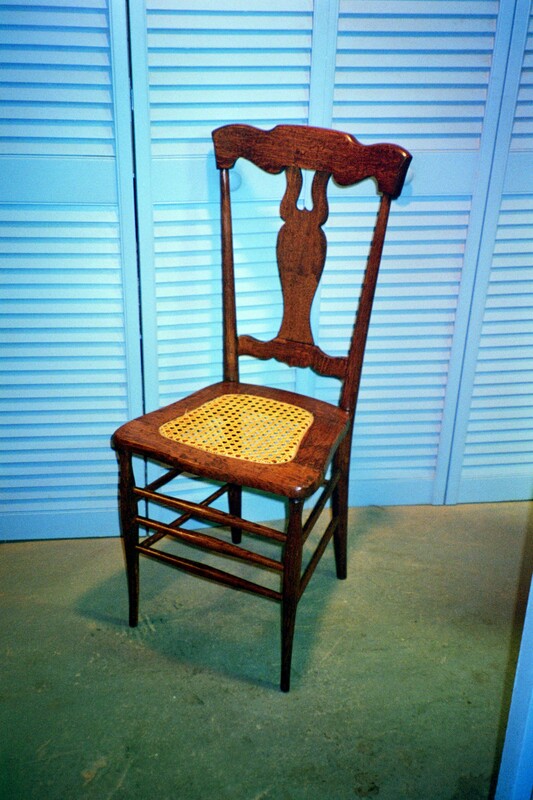 One good reason is that it is a mid 1800's Federalist Beehive Eastlake chair. I think it turned out very pretty - even beautiful. 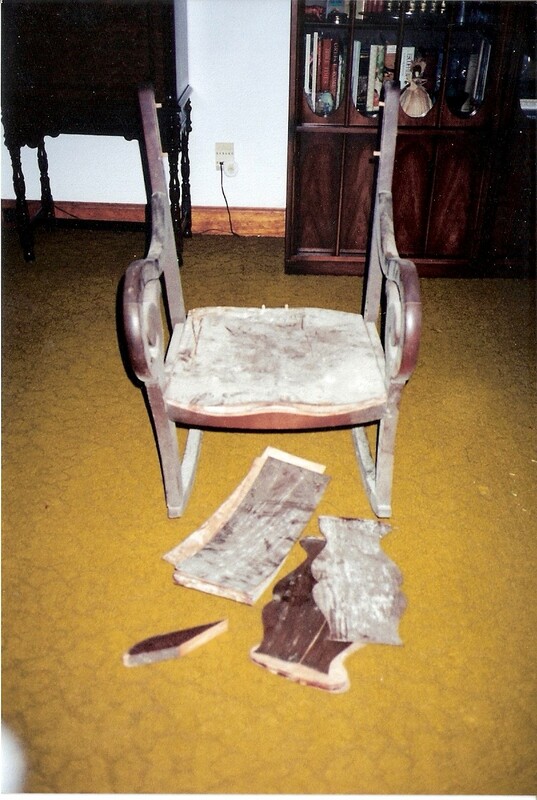 "...in conclusion, your Honor, I submit to the court that this Courthouse Windsor Chair is beyond repair." "I object!" 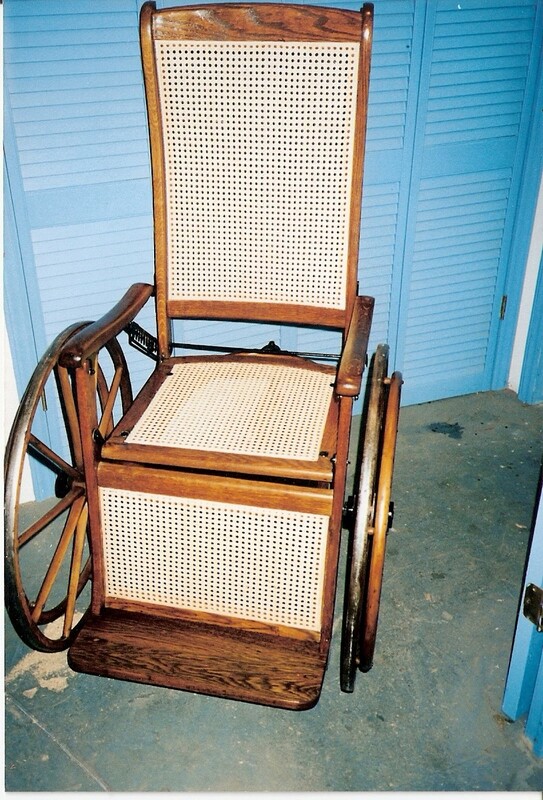 shouts the Chair Doc. "Throwing away this fine piece of craftsmanship would be the real crime. 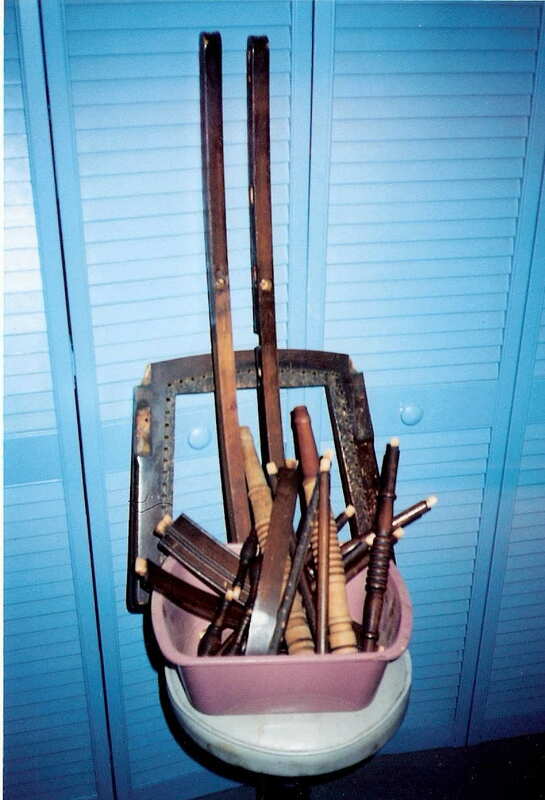 The owners of this chair are guilty of neglect. Let me rehabilitate it." 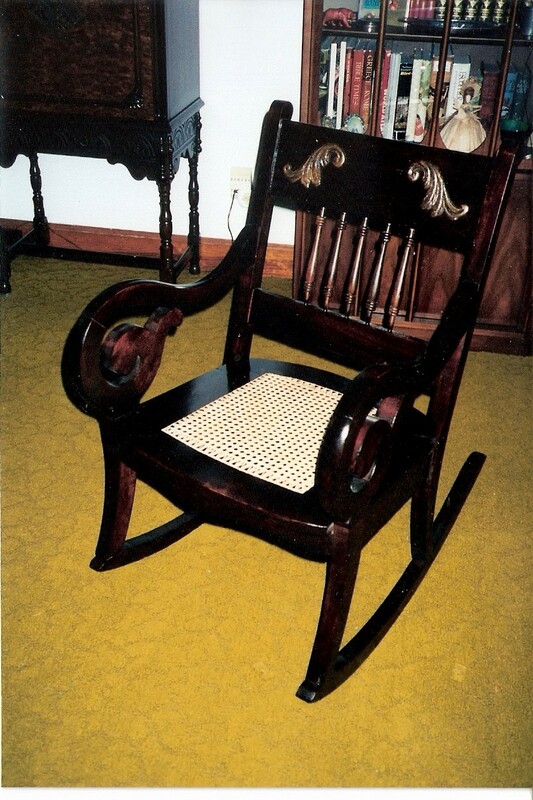 This chair features knuckle arms, a distinguished bow back, and nine spindles, and had a broken corner rush seat. What's the verdict? The results are self-evident. Talk about an heirloom. An elderly woman wanted to know if this could be fixed. It was a gift on her grandmother's wedding day...from HER grandmother. 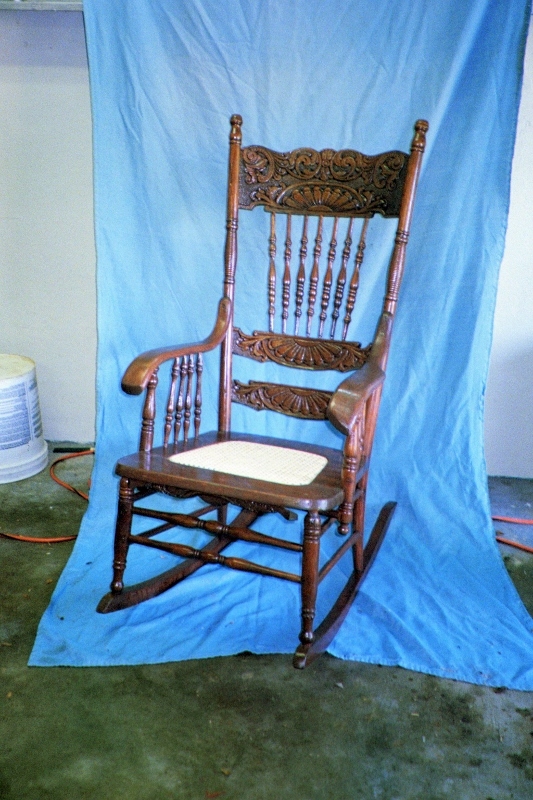 This rare oak rocker has triple carved back and front pieces. 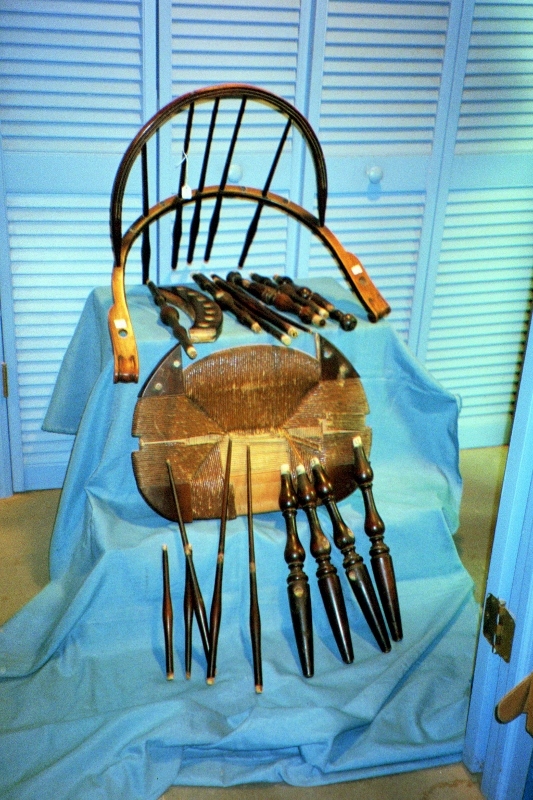 Several missing and broken pieces needed to be replaced, along with a new cane seat. 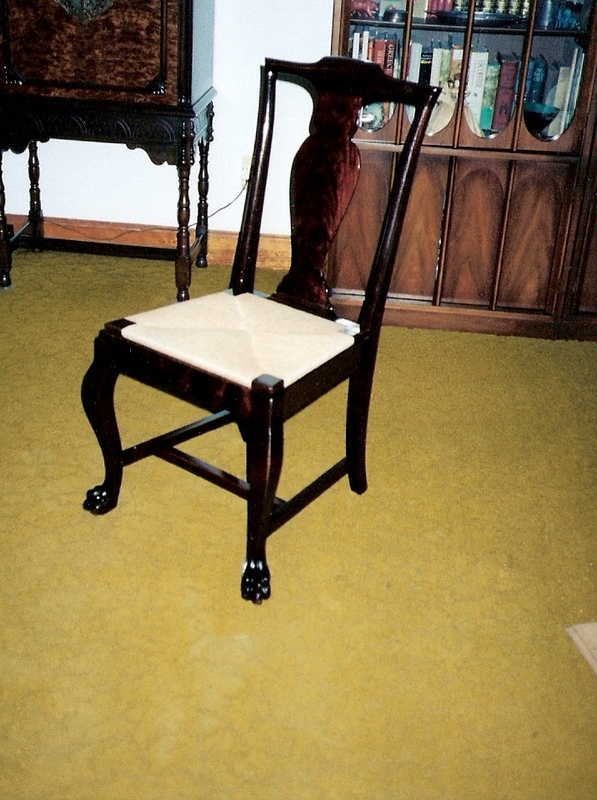 She had a tear in her eye when she saw it completed, and even old Chairdoc got a little misty. 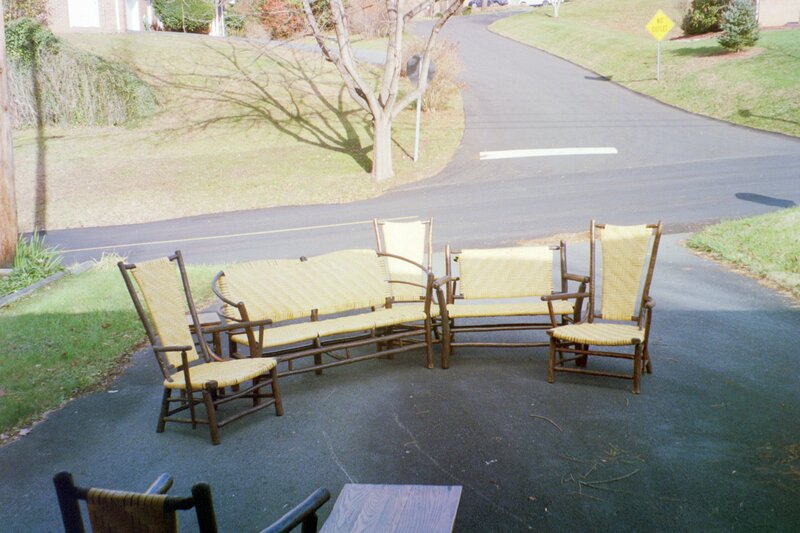 This porch set was crafted by the Old Hickory Furniture Co. of Indiana many years ago and needed new reed. 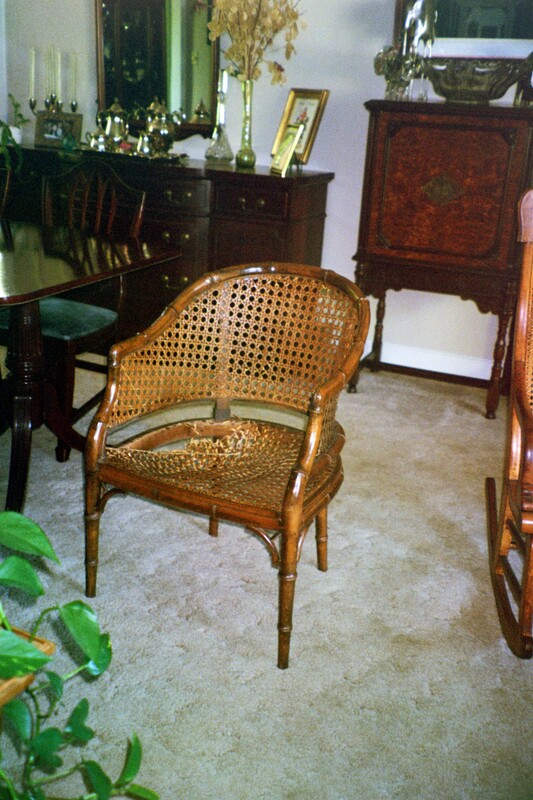 I replaced it with a stagger pattern of rattan. The two chairs, two couches, and a swing are ready for several more years of watching sunsets from the deck. Even though the pieces are bigger, they still require attention to detail to keep them beautiful and worry-free. 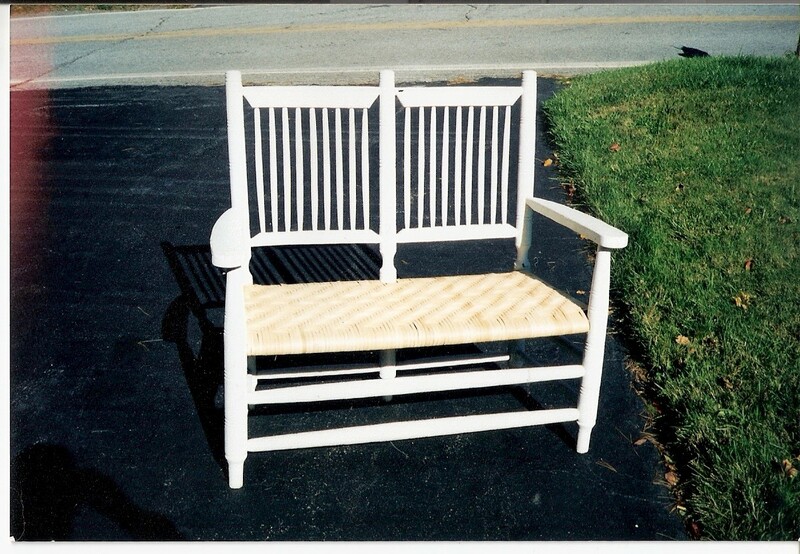 I may not know much about mending relationship (I love the missus - She tolerates me and my hobbies), but I can make this love seat something worth sitting in with your honey. Remember the comment about the bear attack? Well, the bear arrived. Fortunately, I was able to re-assemble it and make it as good as new. I don't want to live near them. 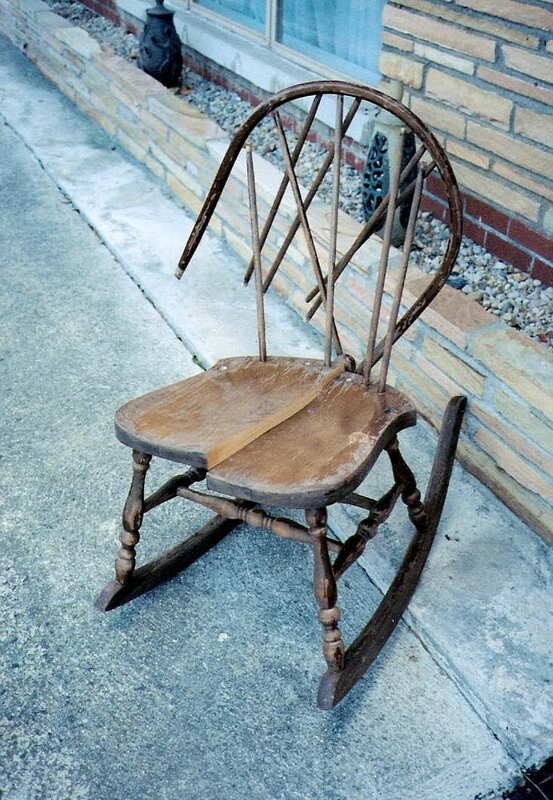 Back in the old days (when I was a wee lad), ladies would sit in a chair like this, flip their hair over the back and let it dry by the fireplace. I then added the missing rockers and replaced the headpiece. 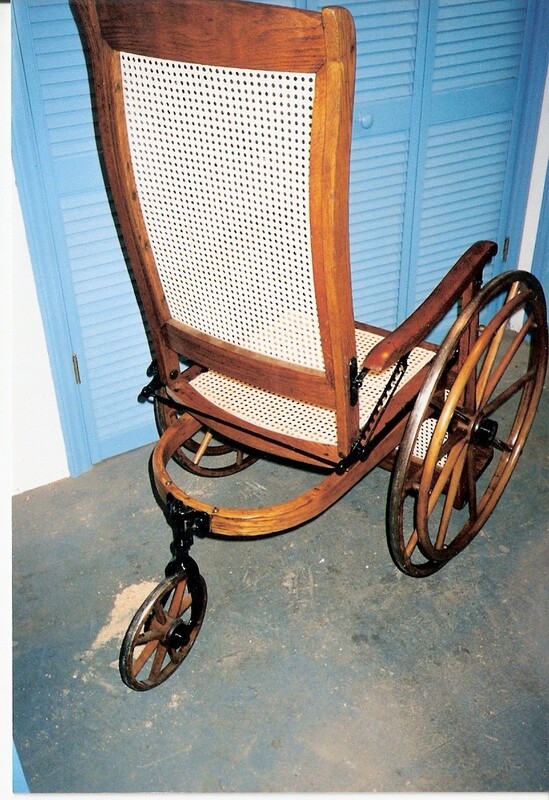 This antique wheelchair came to me and I gave it love and attention to detail. 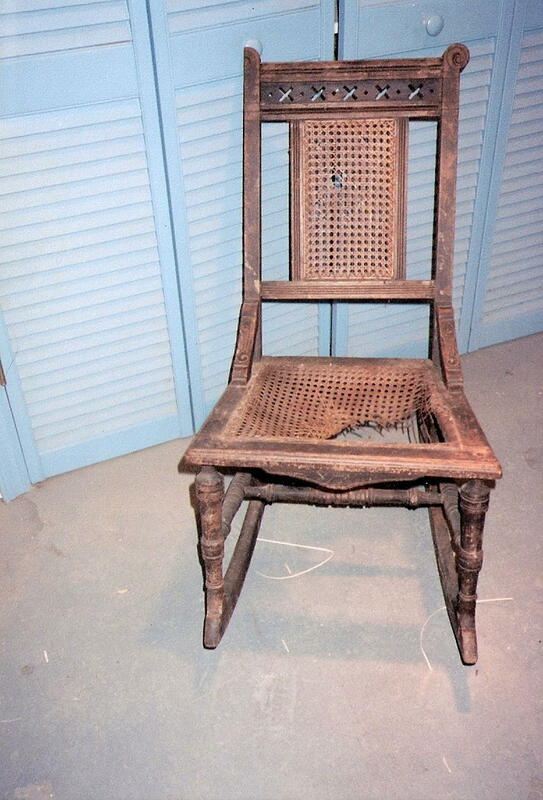 The back, the seat, and the leg were caned, as well as re-finishing it back to its original beauty. Much better results than you get from most health care plans. I didn't know what was worse: The broken back or the horrible paint job (jobs?). Both were fixed and the results are breathtaking...in a good way. No wonder Junior was crying so much! 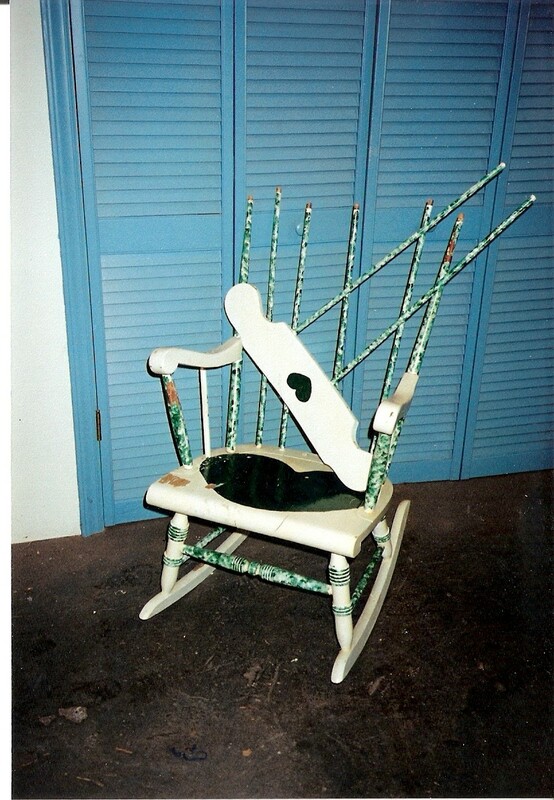 This high chair was in sad shape. Let's give him one less thing to talk to his therapist about and make this high chair the envy of his preschool. 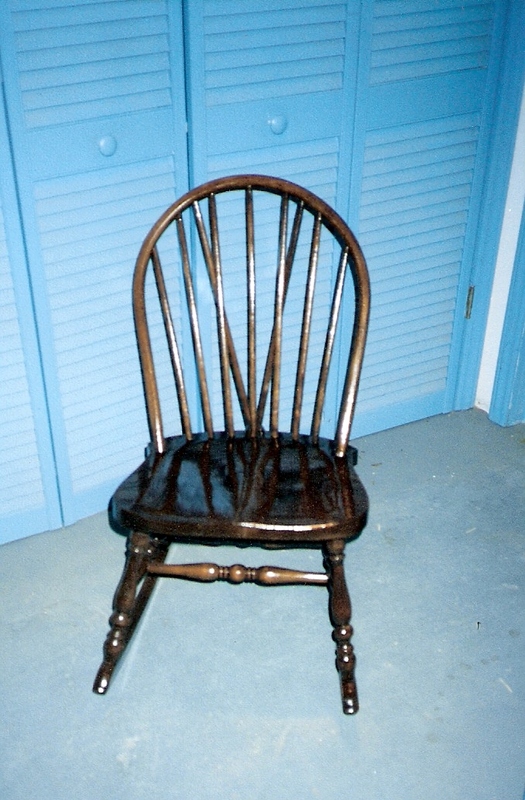 Re-caning and refinishing this chair was just the beginning. Notice the detail on the back. 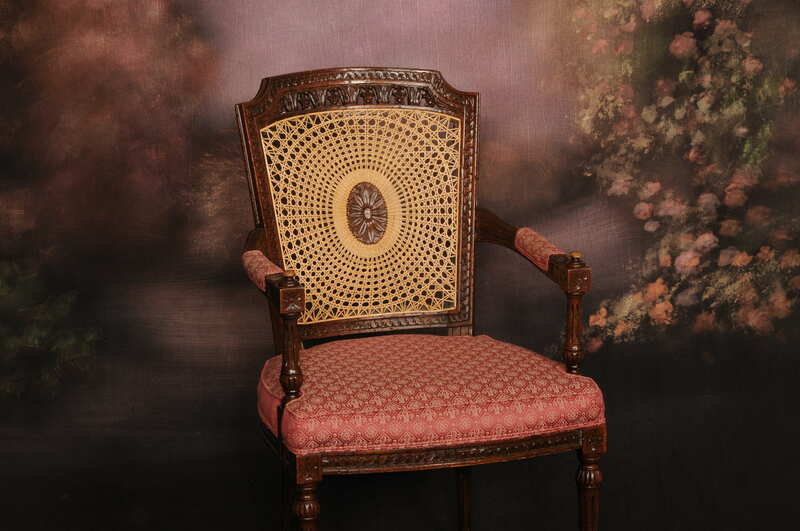 Part of this was missing, so a mold was created to reproduce the design of the embellishments to bring this chair back to its glorious splendor. "Bubba Junior, how many times do I have to tell you NOT to stand on those chairs?!" Apparently, at least four. Chair Doc can fix the chairs. You're on your own for Bubba Junior. I love the old TV shows. 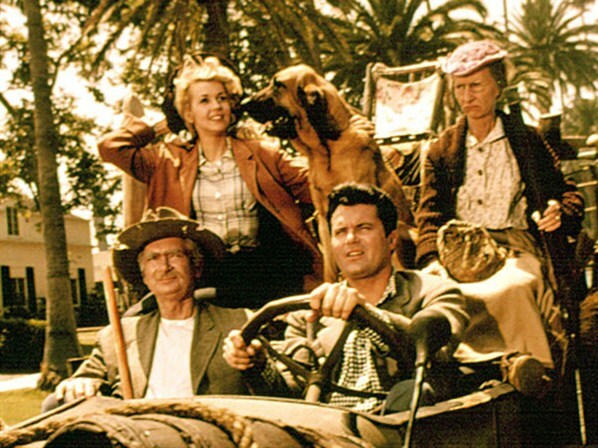 But one thing bugged me about “The Beverly Hillbillies”. Why put a beautiful chair on top of a truck? At some point, it’s going to fall off, like it looks like this one did. 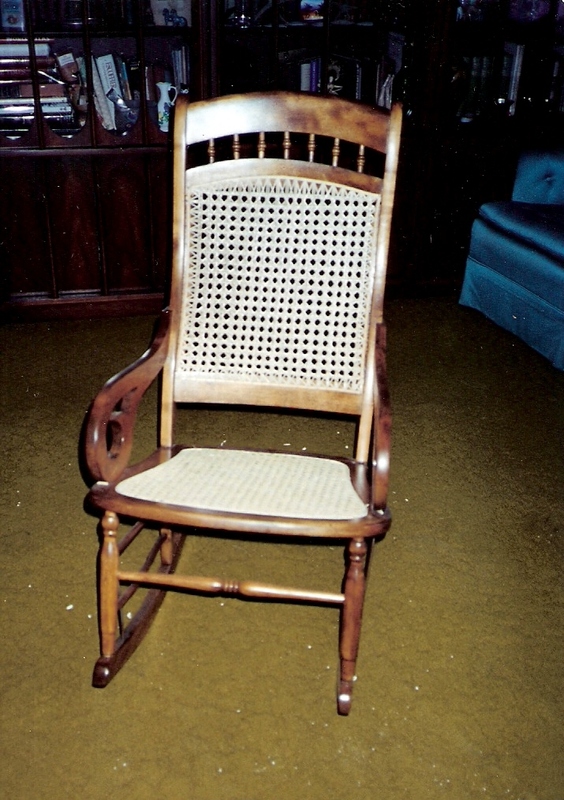 This pressback chair from the 1880s had two broken arms and a missing spindle that I had to make from scratch. Now that it’s something worth admiring, please don’t drive it around Beverly Hills. This group of 24 pieces came to me from the National Park Service. They were sitting in a Welcome Center someplace, but not looking very welcoming. There is no manufacturer logo on any of these pieces, which makes them “primatives”, or handmade by someone instead of by a company. That makes them a truly one-of-a-kind set. You know how sometimes a cat will just run around the house in a crazy fit? (I told my granddaughters that they’re chasing the Tooth Fairy when that happens.) 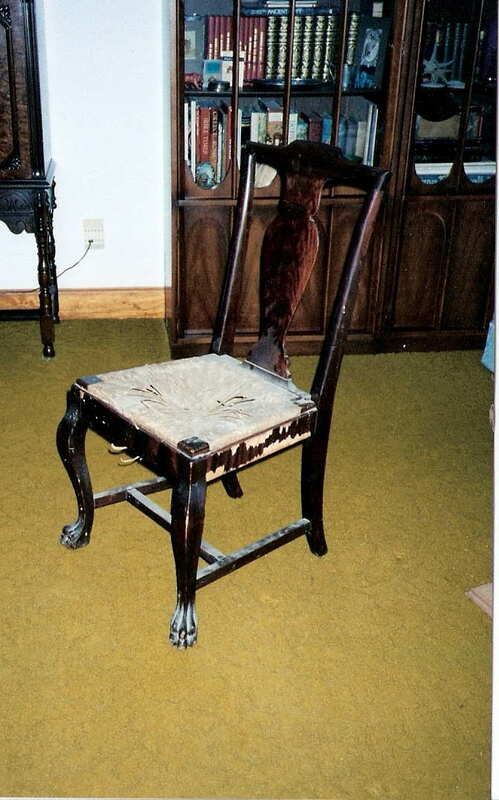 This chair looks like kitty got a hold of the seat and wouldn’t let go, and used the one side as a scratching post. Maybe the cat knew that this would look better with a press-in seat. What’s in the middle of each of these seatbacks? It’s a handmade walnut medallion with a painted picture on it. Each one is different. I decided to accent it with a sunrise caning pattern, a substantial upgrade to the boring straight-across that was there before. 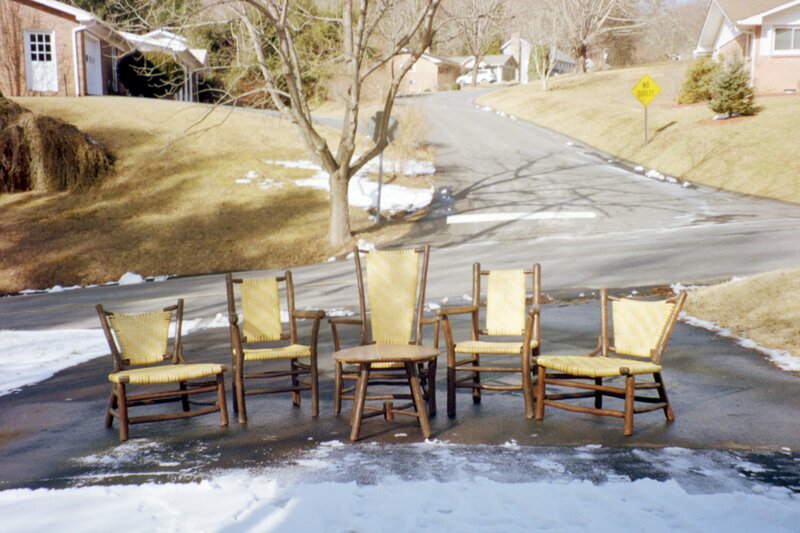 Now instead of just being chairs, they are conversation pieces. 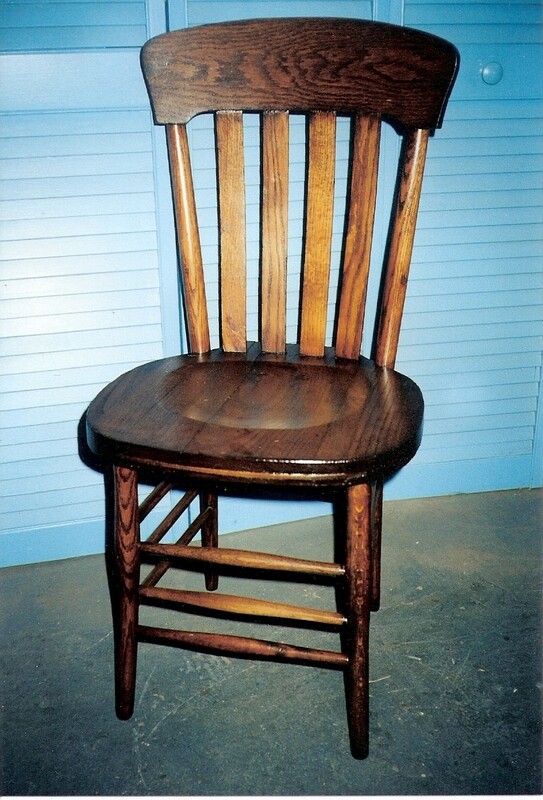 Take a look at some heavy-duty chairs made by the Bumpe Furniture Company. 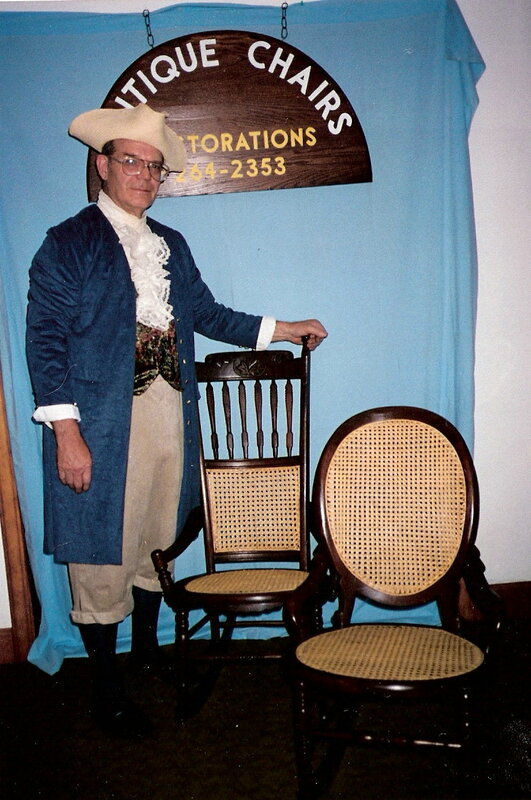 They made big, solid chairs for their customers in the Midwest. There were made between the wars. 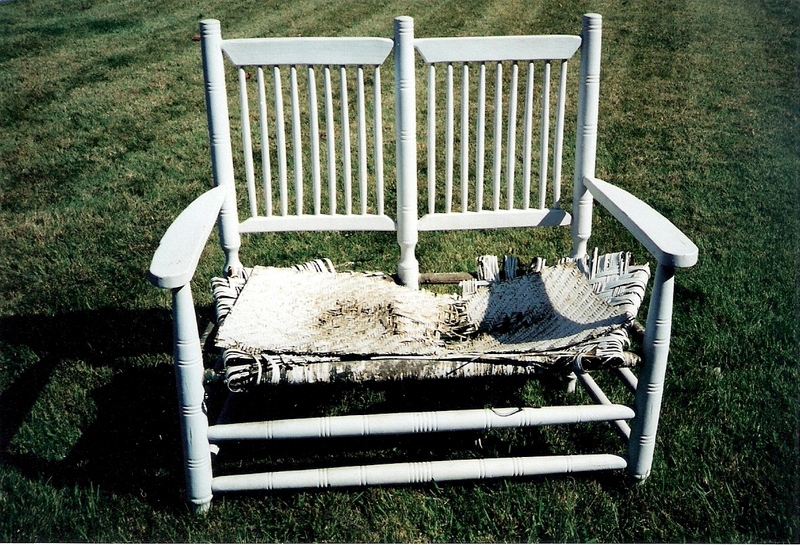 THIS is the type of chair you use to fend off a bear attack! 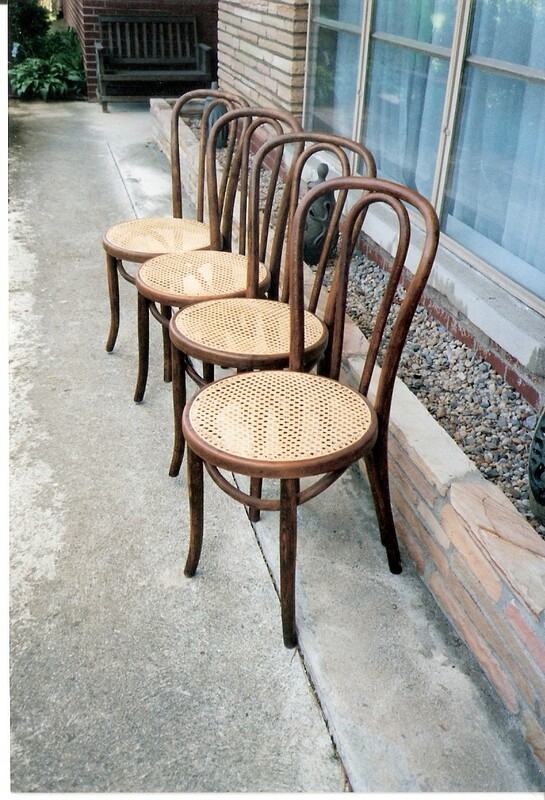 If you come across any chairs like this, let me know, because they will last forever. 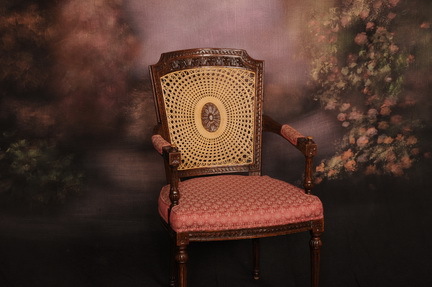 Want to add a touch of class to a room? 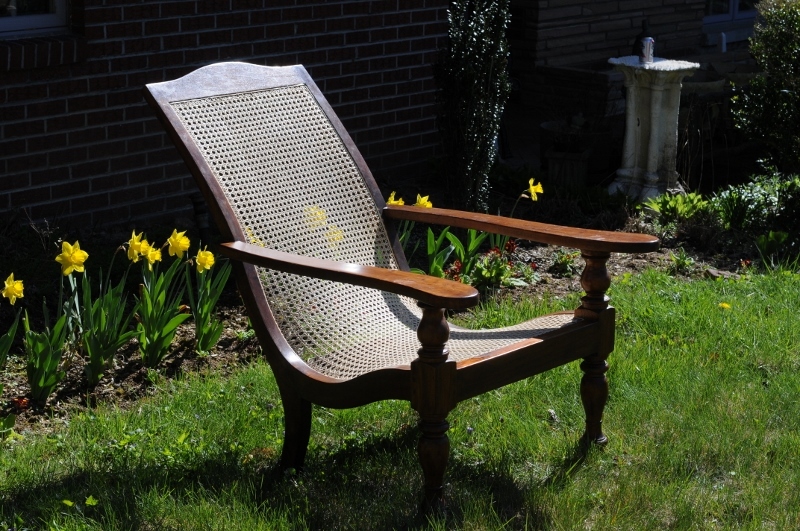 This English Design chair made in New England will get everyone’s attention. I stained it darker and used a tighter weave to give a royal feel to it. It would make an excellent gift for your next Royal Wedding or baby shower. The Green Man usually shows up as a sculpture of dense foliage in many cultures around the world. Who knew he would show up in Boone as a busted up mess? There's a big chunk out of the front arm support, the seat was stained, and everything was broken off. It took a lot of TLC, but we finally made Green Man happy. 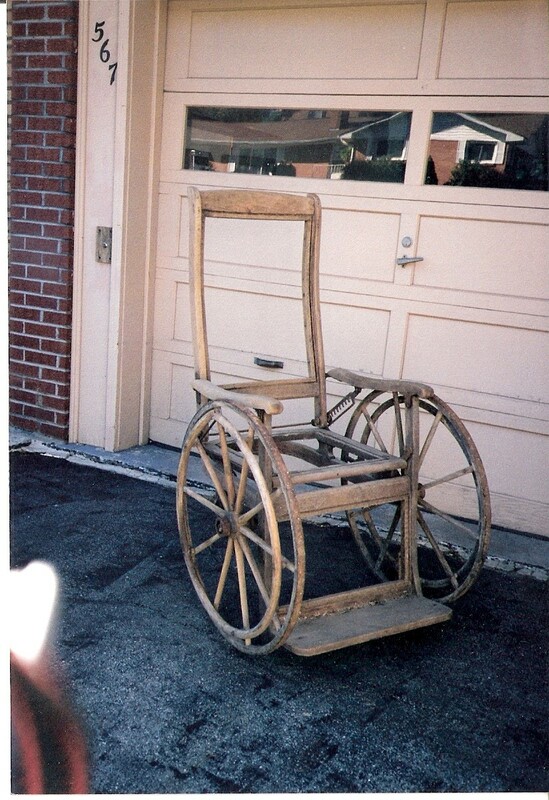 No job too big, except having to tell Mrs. Chairdoc that she can't park her car in the garage. Call us at (828) 264-2353. I also accept products sent by UPS or FedEX. In Raleigh and surrounding areas, feel free to contact my daughter, Lizzie, at (919) 878-0605.